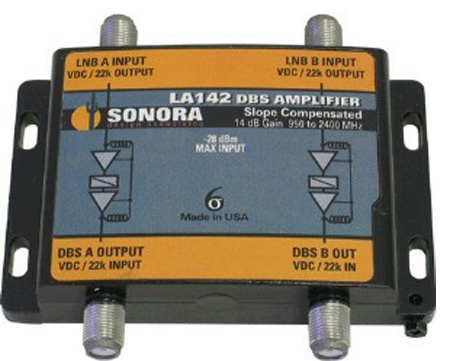 LA142 amplifiers compensate for 125 feet of coaxial cable loss from the LNB to the DBS receiver. 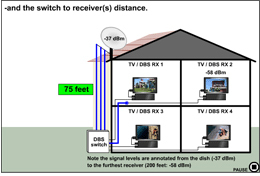 Gain of 14 dB is complemented with 4 dB of slope to keep the DBS spectrum flat from transponder 1 to 32. High Return Loss matches the amplifier to the cable and minimizes reflections. The LA142 is receiver powered and passes both the DC and 22 kHz / DiSEqC signals to a switch or LNB. Current draw is only 50 mA (per channel) so receivers operate within their current limit. A maximum input of -28 dBm and a noise figure of 6 dB allows the amplifier to be placed at the dish or the receiver.